The phrase, “tip of the iceberg“ references the fact that there’s much more beneath the surface of the water where an iceberg exists that is greater a threat than what is visible above the water. Today in the Middle East we need to coin a new phrase that references the exact opposite: that which is beneath the surface is just a small representation of a much more dangerous threat above the surface. 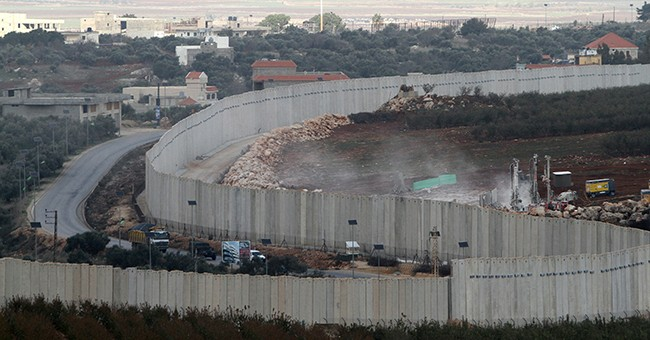 This week, Israel revealed the presence of terror tunnels coming across the border from Lebanon into Israeli territory. The army launched Operation Northern Shield, destroying the first tunnel that was not yet fully operational but heading into an Israeli civilian community. This presents a new threat from Hezbollah, the Iranian backed terrorist group that controls Lebanon: the first such terror tunnels that have been revealed, with the potential threat of many more. According to the IDF, the tunnel found Tuesday originated in Lebanon and was approximately 200 meters long. It was some 25 meters below the surface and approximately two meters tall by two meters wide. This would easily make it large enough for heavily armed terrorists to pass through. The IDF released a video of terrorists discovering an Israeli robot that penetrated the tunnel, intuitively forewarning its destruction. Prime Minister Netanyahu stated, "These cross-border terror tunnels were built by Hezbollah with direct support and funding from Iran. They were built with one purpose in mind – to attack and murder innocent Israeli men, women and children. This is a grave violation of Israel's sovereignty, and a gross violation of UN Security Council Resolution 1701. It is an unacceptable act of wanton aggression. The employment of underground tunnels to strike at Israel is not new. It’s well known that Hamas in Gaza has used terror tunnels for many years. They have dug numerous tunnels, some penetrating into Israeli territory as much as half a mile. These tunnels are built, and have been used to conduct terrorist actions such as kidnapping Israeli soldiers and attacks on Israeli communities adjacent to Gaza. Hamas terrorist tunnels also permeate under the Egyptian border and throughout Gaza itself, as if it were a subway system that transports people commuting to work. However, the Gaza terror tunnels are used to smuggle weapons and terrorists, outside the view of Israeli intelligence. They are also known to be used for human trafficking. Gaza’s terrain is much easier to build tunnels because it’s sandy and relatively soft. The Hezbollah tunnels, under Israel‘s northern border, pose a new threat. They are dug under a much harder surface making the engineering required more sophisticated. The other challenge, for which I am sure Israel has been preparing for many years, is that Hezbollah has a relatively free flow of sophisticated weapons from Iran and is known to be especially well armed. Its terrorists are battle tested having fought alongside and on behalf of the Assad regime in Syria in a war that’s almost a decade old. The above ground threat from Hezbollah in Lebanon is much more significant than the underground threat, the opposite of the tip of the iceberg. Hezbollah is known to have some 150,000 long and short range rockets and missiles ready to fire at Israeli communities as soon as they (or Iran) deem it valuable or worthwhile to initiate a military campaign. Recently Prime Minister Netanyahu met with American Secretary of State Pompeo to discuss the threat from Iran and Hezbollah. This is far from the first time Israel has made public its awareness of the Hezbollah/Iranian threats. Israel has revealed maps documenting that it knows where many military targets, including where many of their rockets, are located. It’s understood that at the beginning of the next significant battle with Hezbollah, these will be among the first targets to destroy as many of the highly accurate rockets that have been hidden in civilian areas. By revealing the location of many of these weapons among the Lebanese civilian population, as Netanyahu underscored with the origin of the tunnel that was destroyed, Israel is also warning the people living there not to allow their backyards, schools, mosques, and churches to be used as a staging ground for a military strike against Israel. Israel will not tolerate such a strike and will retaliate accordingly, punishingly, if not preemptively. Other than publicizing this as a military strategy, and as a humanitarian gesture to avoid unnecessary death of people living in the immediate range of where these weapons are being hidden, this is also a warning to the international community to restrain both Iran and Hezbollah from ever using the weapons that they have amassed. Despite the US, Britain, Germany and even Russia acknowledging Israel’s rights to defend itself, unfortunately, one cannot rely on the international community not to condemn Israel when it is forced to undertake a military strike. In the case of an Israeli strike on these targets, international condemnations of Israel and calling to “show restraint” are inevitable. We also cannot rely on the international community to prevent arms from flowing to the terrorists in Lebanon to begin with. At the end of the Second Lebanon War in 2006, Israel negotiated a cease-fire under United Nations auspices. Security Council Resolution 1701 required the UN to supervise and prevent Hezbollah from re-arming after firing tens of thousands of rockets at Israel that summer. Yet the international community has failed miserably in its responsibility. It is well known that Hezbollah now has many more weapons than it did in 2006, ones that are much more accurate and which pose a greater overall threat. What will come of this in the short term is anyone’s guess. It's certain that Israel has its intelligence abilities at the ready. But it is no game. Hezbollah might use this as cover to attack Israeli military engaged in destroying the tunnels, or some other pretext to do so. Time will tell. One thing that is a near certainty is that peace is not likely to break out any time soon.